First perfect game of Pac-Man attained! In Search Of... The Elusive ! I remember seeing Pac-Man for the first time at a little arcade in Penticton BC, Canada. It had a huge crowd of people around it. I couldn't even get near it to see what all the hubbub was about. When I did, I remember two things striking me - the colours and the feeling that this was something different. What I must have meant by that, was that it was different from Space Invaders type shoot 'em ups, the Breakout / Pong style paddle games and the blip cars racing around a track games. This was truly unique, at least for a little while. But as with all popular games, it was soon cloned to the max. How many quarters did I eventually plug into Pac-Man machines in and around Penticton? I'll never know, but one thing is for sure... I don't regret one of them! Thanks Namco! And thanks Midway, for bringing it to America! Read CNet Gamecenter's history of Pac-man while it's still there. When this link is broken, can someone let me know? Thanks. See Pac-Man flyer1, flyer2 or view all of the Pac-Man family flyers here. This is what my machine originally looked like, when it was brand new (long before I had it). The image above is what my cabinet looks like, except for the glass art. Mine has a Ms. Pac-man underlay. If you want to see what my glass underlay looks like, click here to view my Ms. Pac-man page. The original Pac-man glass underlay that had come with the machine had been painted over in black. After unsuccessfully trying to remove the paint, I finally picked up an old Ms. Pac-Man underlay on ebay (note: may the buyer beware). The first thing I did was perform the 4 game hack (link has been restored!) on the PCB. It now plays both Pac-Man and Ms. Pac-Man, in both regular and speedy mode. I performed this as carefully as I could so that it is completely UN-doable at a moments notice. Now I don't feel too bad about the Ms. Pac art, as the machine actually does play the Ms. anyway. My CP overlays leave a little to be desired though (see latest news below for an update). Maybe someday I will be able to afford Two-bit's price for new ones. Latest News: I recently took someone's suggestion and printed some new cp overlays on a colour laser printer. Then I had them laminated. After replacing the player 2 overlay with one of them, it looks a million times better. The overlay on the player one side isn't bad enough to warrant peeling it off. It's good enough for me to want to preserve the original, at least for now. As of September 2, 1999 I now own an original Ms. Pac-Man machine! 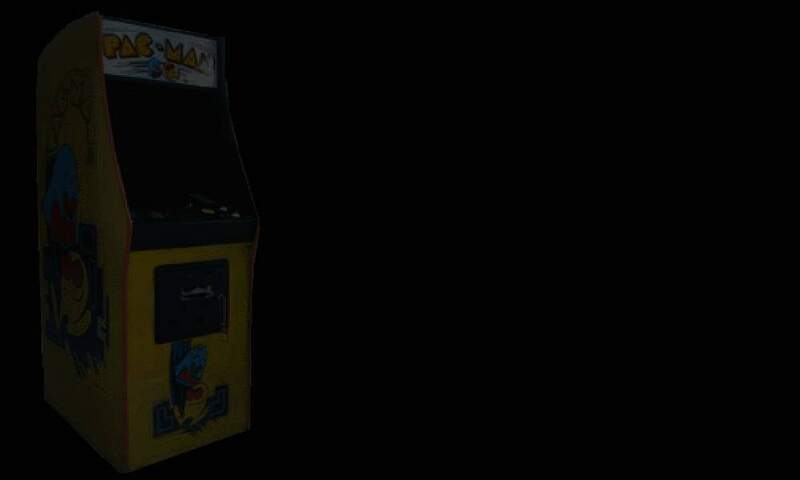 As of December 23, 1999, I have sold this machine, but I will continue to maintain a separate Ms. Pac-Man page. Because of that I have split this page and now have a separate Ms. Pac-Man page. Be sure and check it out. I have moved most of the Ms. Pac-Man info that was here to that page. This should have the added benefit of making this page load faster. Before you go, be sure and check out my Ms. Pac-Man page. You can continue on the Pac-Land WebRing from there as well.